Hydraulic fracturing, commonly known as “fracking”, involves pumping water, chemicals, and a proppant down an oil or gas well under high pressure to break open channels in the rock holding the oil or gas. The proppant, typically sand, is designed to hold the cracks open once they are formed. This allows oil or gas to flow to the well with less resistance, which increases the amount of material that can be recovered. A frac hit is typically described as an interwell communication event where an offset well, often termed a parent well, is affected by the pumping of a hydraulic fracturing treatment in a new well, called the child well. As the name suggests, frac hits can be a violent affair as they are known to be strong enough to damage production tubing, casing, and even wellheads and ultimately losing well control. Aside from equipment damage, loss of production due to a frac hit can range anywhere from a temporary loss to a permanent loss of production, although in some rare, unusual cases, some frac hits have known to increase production. Many of today’s producing horizontal wells are spaced much tighter together than before, thus, dealing with frac hit events has become much more prevalent. One way to mitigate frac hit consequences is to monitor the pressure of neighboring wells that may be at risk. The neighboring wells can be monitored wirelessly and provide the data into a SCADA system. In addition, the critical pressure data can also be processed locally and provide a “trigger alarm” to the frac control room. This enables the control room to know immediately if a well is seeing communication and which well is seeing it, thus, allowing them to take immediate corrective action. One of the benefits of a wireless solution is that it can be packaged into an easily deployable field kit. OleumTech manufactures rugged, self-contained, battery-powered Class I, Division 1, Intrinsically Safe Pressure Transmitters that can be deployed on the neighboring wells instantly, since the deployment requires no wires, permitting, or digging. The Pressure Transmitters can be pre-programmed and put into a sleep mode until ready to use, thereby maximizing battery life. When ready for commissioning, the transmitters can be activated with a touch of a button. The wireless receivers or gateways that collect data and communicate with third-party SCADA systems are Class I, Division 2 devices that can also be pre-programmed to receive the data from the Transmitters upon power-up. Other than the connection to the SCADA system, the Gateways simply require a 9-30 Vdc power supply and an antenna setup. While the actual pressure and diagnostic data can be provided to a host SCADA system via long-range communications (cell modems, satellite modems, or private radio network), the data provided to the frac control room will simply be discrete outputs (alarms) which are scaled values from the wireless transmitters to generate discrete outputs when a defined pressure threshold has been reached. This threshold can be individually adjusted for each well. 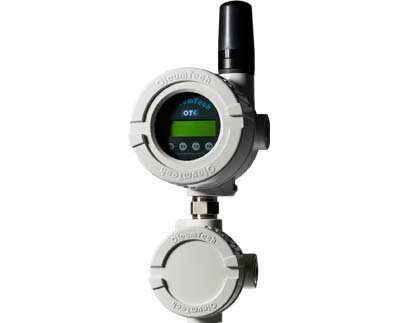 Given that the wireless transmitter has three analog inputs, a single pressure transducer can be utilized and the signal jumpered across the inputs to allow scaling of up to three different values/setpoints. 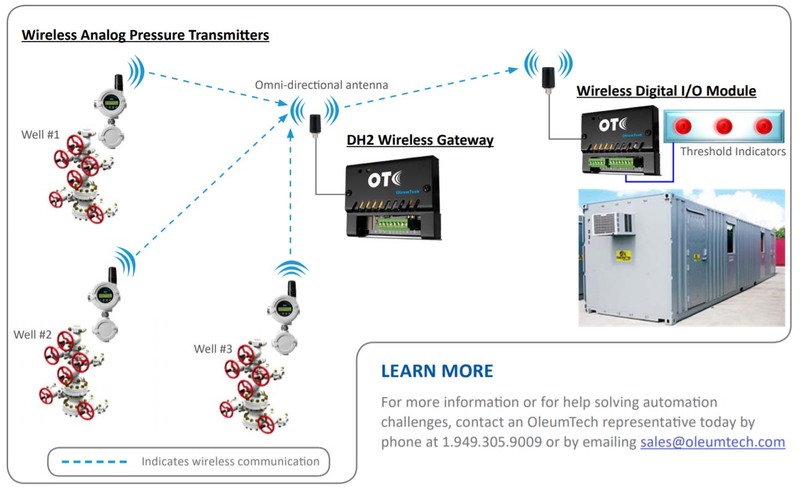 Networking Diagram Shown with OleumTech OTC Wireless Automation Products. OleumTech provides one of the best and most cost-effective wireless monitoring and control systems for monitoring critical assets while also providing alarm triggering capabilities based on user configurable pressure threshholds for mitigating frac hits from damaging neighboring wells. For more information or for help solving automation challenges, please contact an OleumTech representative today!